Team Portsmouth FO raising money for DSF! Thanks everyone! In celebration of its 100th Anniversary, DSS is sponsoring a “DSS Global Race for Charity” to take place at 100+ locations overseas and in the US. All RSOs, Field Offices, and HQ directorates are encouraged to organize a 5K run and raise funds for worthy charitable causes. Well what do you know? DSF is just such a worthy charitable cause! So pick us as your charity of choice. DSF is a genuine, real-deal 501c3 nonprofit charity with a global reach. 100% of our grants are given to members of our world-wide DS "family" (see our GRANTS page for a list of all our grants). The easiest way to set up a fundraiser to go along with your race is through an online crowdsourcing platform. Our two favorites are GoFundMe or Razoo. The benefits of using one of these platforms is you can set up a page, direct your participants to make a donation there, and it will keep track of how much you've raised. Be sure to invite us too (manager@dsfoundation.org) so we can watch your total climb! If that seems like too much effort, you can simply collect checks and send them to us (make checks out to "DSF" and send to us at DSF, PO Box 228, Dunn Loring, VA 22027). Or direct your participants to our DONATE page and make sure they note in the "Addl Info" field which race this is for. Please let us know if your group has picked us as your Charity of Choice - we'll list groups and the totals they raise on our behalf. Team Belmonpan, Belize raised $482 for DSF. Way to go! 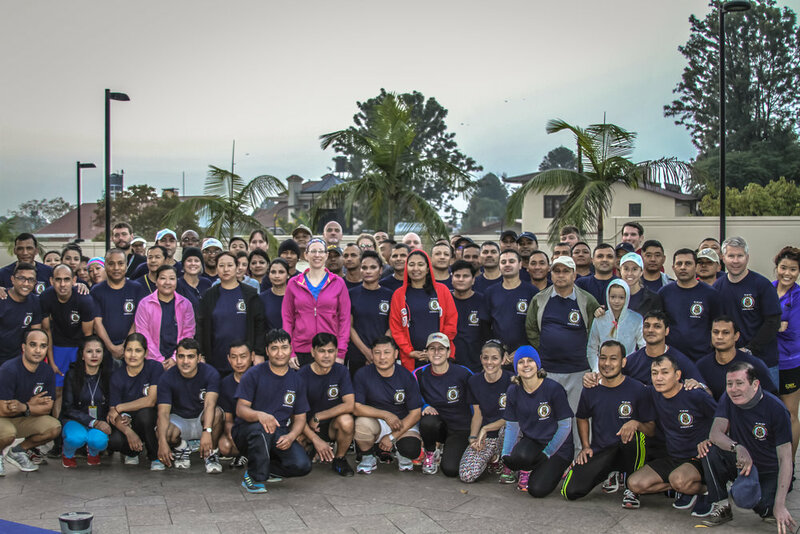 Team RSO Kathmandu had a great turn out! They raised $230 for DSF. Team RSO New Delhi and the OSAC New Delhi Chapter. They held a 5k run & 3k walk with over 500 registered participants. They raised $3,200 for DSF. DS Public Affairs, along with their friend Teddy Roosevelt, raising funds for DSF. Way to go Team Manama for raising $579 for DSF!! RSO Bujumbura, Burundi raised $100!